Corporate eLearning Strategies and Development: My I/ITSEC Experience - Simulations Galore! My I/ITSEC Experience - Simulations Galore! Wow! 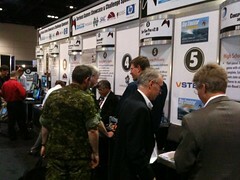 I spent a day and a half roaming the aisles of the Interservice/Industry Training Simulation & Education Conference. Interactive, immersive, 3D, simulation creation is alive and well. I was expecting to see lots of military simulations, and that's exactly what I got. I drove a truck and took on sniper fire and an IED during my simulation "ride". It was very cool but the screens made me woozy. They said room tempurature has something to do with that, but I'm certain I just have a weak stomach. There were also simulations for battle medics that were TOO real. They had full size models of injured soldiers with legs blown off, and another with half his face blown open. Shocking! 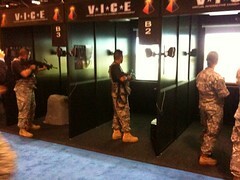 But its the reality of war and needs to be simulated to prepare the soldiers. Basically everything related to battle has a simulation of some sort. Plane sims are obvious, but how about a full size truck that simulates a roll over and your goal is to get out of the vehicle...FAST! 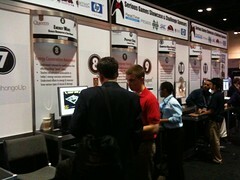 The thing that really stood out for me was the fact that most of these simulations were being run on LAPTOPS! A far cry from the stacks of SGI boxes required over a decade ago. 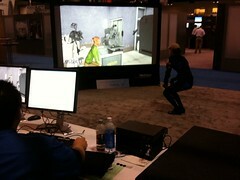 It was fun to see the heavy use of collaborative simulations. I loved the use of networked laptops that allowed for multi-player simulations. One example was in a ship simulation that connects the engine room simulation with the ships navigation room simulation. So, basically the guy learning to drive the ship is impacted by the guy learning about the engine room in real time. If the guy running the engine room shuts down the generator while he is training, then the guy training to drive the ship gets all the feedback he would get in real life if the same thing happened. Collaborative combat missions were obvious since junior high kids have access to multi-player warfare experiences. But in some of the simulators you got to hold a very real rifle or pistol, or heck, they even had a simulation for a rocket launcher. As my son would say, "sweeeeeeet". The mixed reality simulations were beyond awesome! Actually, as I type this on the plane home I'm stumped as to how I can use words to explain how you turn an empty space into an instant virtual building with many rooms that need to be cleared by a team of soldiers. What I see is a couple soldiers loaded with gear wandering around a large open space. THEN you see the screen displaying what THEY are seeing inside their visors. Wow! Every movement they make is mimicked by a virtual avatar immersed in a virtual space with walls doors...oh yea, and simulated bad guys with guns and grenades. Simply amazing. Oh! And there was also the "gerbal ball". No, seriously. A human sized gerbal ball that a soldier gets into and can run around a limitless virtual space. The ball rotates in all directions but stays in one place. However, the player is immersed in a virtual space and runs inside the gerbal ball to move around "in world". I wonder if I can get that for World of Warcraft? So much for gamers not getting any exercise, right? I've got to thank Mark Oehlert (@moehlert) for showing me around when I first got there. Since he works for the Defense Acuisition University he could fill me in on all the military struc tures and lingo, and how things work...or don't work. With limited time, it was nice to get the inside scoop. It was also great to see "The Beard" (@mrch0mp3rs) and others involved with SCORM and LETSI. I also saw the folks from Tandem Learning and Hybrid. These were the folks behind the cool alternate reality game (ARG), The Zombie Apocalypse, at DevLearn09. I heard mumblings of an even bigger and better ARG for DevLearn2010. They are an impressive group of developers and I'm looking forward to seeing what else they come up with. And of course, the Serious Games Czar Dr. Alicia Sanchez (Host of the DevLearn Serious Games Zone) did a great job with the Serious Games Showcase and Challenge at I/ITSEC. I've always had a passion for simulations and virtual spaces. I have fond memories of building one of the first inexpensive interactive 3D simulations for the semiconductor manufacturing industry (I think it was a diffusion furnace) and then moving on to virtual warehouse simulations with SAP software sim integration. Oh, the memories. I/ITSEC brought me back to seeing why simulations are so important to learning and more importantly to PERFORMANCE. Its all about the DOING! Learning is one thing, but actually learning how to DO something productive has value beyond words. Ooooh. I want a gerbil ball. Think Santa will bring me one? Wow. "Its all about the DOING! Learning is one thing, but actually learning how to DO something productive has value beyond words." - very well said. @susan: Yeah, I think I like one too. Hehehe, I hope Santa can fit through our chimney.